Home» AP DED Timetable | AP DEECET NEWS | AP LATEST update | AP LATEST UPDATES » AP DED (D.EI.Ed) Second/IInd Year Exams December-2017 Time Table Scheduled Download. 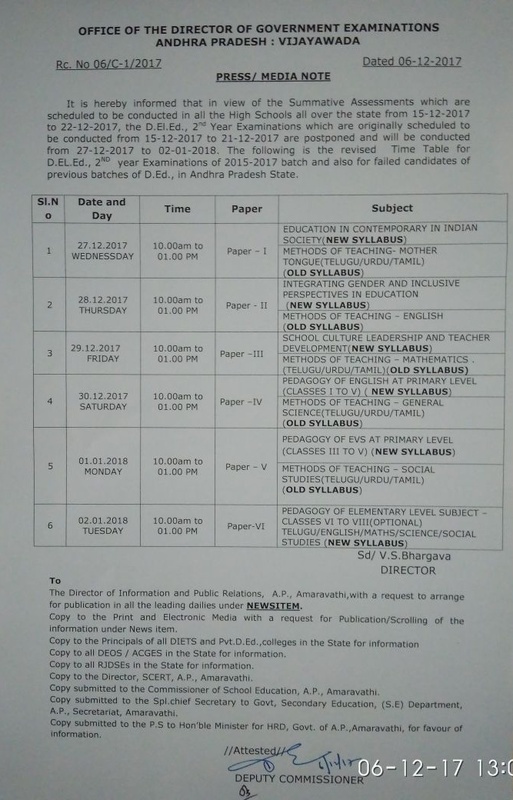 AP DED (D.EI.Ed) Second/IInd Year Exams December-2017 Time Table Scheduled Download. AP DEd (D.EI.Ed) Second/II nd Year for 2015-17 batch Exams December-2017 Revised Time Table 2017 Scheduled from 27.12.2017 to 02.01.2018 Time Table Scheduled Download,AP DEd (D.EI.Ed) Second/2nd year Examinations for 2015-17 batch Examination December 2017 Scheduled/Time Table Scheduled Download as per Rc No.10/C-1/2017,AP DED (D.EI.Ed) Second/2nd Year Exams December 2017 Time Table Scheduled Download/AP DED (D.EI.Ed) Second/IInd Year Exams December -2017 Time Table Scheduled Download. 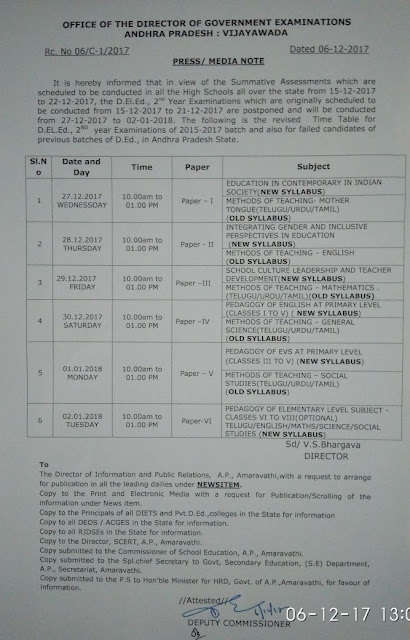 AP DEd (D.EI.Ed) Second/2nd year Examinations for 2015-17 batch December-2017 Revised Examination Time Table/Examination Scheduled Dates from 27-12-2017 to 02-01-2018 Download as per Rc No.10/C-1/2017, Dated:25-06-2017. It is Notified that the D.EI.Ed IInd/Second/2nd year Examinations for 2015-17 batch will be conducted in the month of December-2017. The Examination Examination Scheduled Dates from 27-12-2017 to 02-01-2018 and will be conducted as per the modified syllabus and scheme approved by the Government.The failed candidates of earlier batches are also eligible to appear the examinations as private candidates, with old syllabus as a final chance. No further Examination will be conducted with old syllabus. The following are the due dates for remittance of Examination Fee and submission of nominal rolls. The Web link to upload applications online will be available from 12-09-2017. The Examination fee is Rs.150/-for regular candidates. The fee has to be remitted separately for regular & once failed candidates through separate consolidated challans in the Government Treasury to the following Head of Account. Separate Challan has to be remitted towards payment of fine of Rs.1000/- per candidate for Spot Admissions made under vacant seats of Convener Quota and Management Quota as per Govt., Memo No. 305891/Prog-II/A1/2016, Dated: 20.04.2017. Fee to be remitted to the following Head of Account. Get Download Rc.No:10 Fee Details Click Here. Get Download DED 2nd Year December-2017 Revised Time Table Scheduled - Click Here.